I think its kind of fitting that my first review is an album that I've been waiting for since around the time I first started thinking of writing a blog. I watched a video about a year and a half ago following Baauer around recording samples which really got me excited about the album - then I didn't hear anything for about a year! The album was released at the beginning of May this year and I think the wait was definitely worth it. The weird thing about the album is that when its broken down into its individual parts I seem to have a few negative things to say about it, but listened from start to finish it really delivers. It opens with Church, a pretty boring soundscape type track which is fine and then blasts straight into GoGo! which really typifies Baauer's sound. A full on trap/bass wall of sound with a trademark off beat "drop" with pitched kick drums and a vicious saw tooth bassline. Probably the best track on the album for me. The following 2 tracks are Body and Pinku, both decent housey type songs, with real summery vibes. Things get back on track with Sow, similar in style to GoGo!, a heads down trap banger with a strange vocal sample and a simple but effective beat underneath it. Day Ones keeps the agression going nicely, this was the debut track promo'd with vocals from 19 year old Lewisham grime newcomer Novelist and New Yorks Leikeli47. Its great to see a nod to how well grime is respected in the States - even though Leikeli gets the lionshare of mic time. Loads of shouty vocals over massive synths. Next up is a mid way interlude called Good & Bad followed by Way From Me which builds into the second half of the album smoothly. 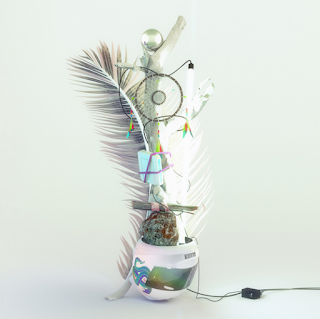 MIA makes an appearance on Temple, similar to Sow, Baauer doesnt try to hog the limelight here, lets MIA and G Dragon do their thing with a really solid but simple track. Make It Bang flirts with EDM ideas, a bit of a 4/4 beat with aggressive main stage synths - not a great song at all in my opinion but there are some good ideas in there, it was just executed with a U.S. festival in mind. Kung Fu is a calling card to all rappers showcasing Baauer's ability to produce really top class hip-hop/trap music for people to rap over - again he keeps it simple and doesn't try to do anything too complicated - he just lets the vocalists get to it. Church Reprise really is a disappointing number, he drafts in Glasgow's Rustie for this, arguably two of the best bass/trap producers around right now get in a studio together and they come out with this - a nothing song, just some synths and electric guitars for a minute and a half. It then closes with a near song, it sounds like Baauer started a track, had a pretty decent idea for it and when the record company came knocking for the finished album he just threw this on at the end. With no tracks longer than 4 minutes (the longest one is 3:32) and 4 songs less than 2 minutes long it would be easy to feel short changed but for some reason it still is a really good album. The good (longer) songs outweigh the couple of non-tracks and hopefully if he gets Rustie in the studio again they will make a track that actually has some beats in it!